Faruk's slim physic was perfect for the job. Or so his mother recalls. Faruk, who died a week ago from a fall, was only 14-years-old. His mother works as help in a nearby house and when her husband abandoned her after the birth of their fourth child, Faruk had been the only other bread earner in the family. "He was only six at that time," Honufa, Faruk's mother says, "He never shied away from hard work." Because his body was agile, he got a job quick; it was risky but he didn't care. He had to climb up the building under construction on a makeshift ladder made of rope to help the mason. It went on smoothly; at the end of the month Faruk would get back home with three five-hundred taka notes in hand. Then the inevitable happened: one evening Faruk slipped from a four-storied building and fell face down. His head hit the ground fast, his skull was smashed and he died on the spot. Even though law bans employment of a six-year-old, Cerberus Group, where Faruk worked, regularly hires child workers. It seems to be in paper only, as no one has heard about it, let alone follow it. 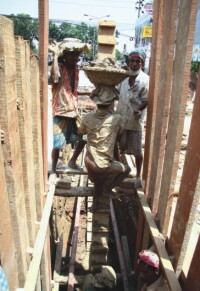 The group's sites have never been visited by anyone from the labour ministry and its Managing Director Gazi Md Mujahidul Quayum is quite frank about admitting it: "There are about 50 child labourers who work in our different construction sites," Gazi says, "And I see no problem in it." He says that if he does not hire these children, some are barely in their teens, their families will not survive. Then why does he give a child worker 1500 taka a month whereas he gives their adult counterparts thrice the amount? "I don't see your logic here," he says, "What will these children do with so much money?" Workers in the informal sector have no voice when it comes to basic rights. themselves from mortal danger. But a string of visits in different sites across Dhaka and Gazipur reveals that no such practises have been followed in the two districts. Nazrul Islam Khan, secretary general Bangladesh Institute of Labour Studies, a non-governmental organisation thinks there are good enough laws in the country, but they are hardly implemented. "The government has formed a commission to reform the existing labour law which was amended in 2006. But what is the point of it if these laws are not implemented?" Khan says. Directorate of labour, the government-run organisation that was supposed to deal with the offenders, is hardly active. Khan says that it is ill equipped and lacks enough manpower. Register of Trade Union (RTU), the other government body that registers trade unions, is alleged to have been corrupt and is notorious for putting up obstacles before budding trade unions. "Trade unions are banned in government offices. However, even though there is no ban on trade union in sectors such as garment and rice processing mills, an unofficial embargo is in place," says Dr Wajedul Islam Khan, general secretary of Trade Union Centre (TUC), the country's one of the largest labour organisations. Wajedul alleges that whenever the TUC applies with the RTU to start a trade union at a rice processing mill, the list of office bearers has always been leaked and the TUC leaders are given the sack for "daring to start a trade union" in the mill. "It has happened so many times that the owners have got a copy of the list of our leaders from the RTU, and have fired all of them from the factory”, says Wajedul. Though the RTU denies any wrongdoing, two conventions of the International Labour Organisation have been rampantly violated--87 and 98. The freedoms of association and collective bargain are ignored in 80 percent of the mills and factories in the country. According to the TUC, the number of workers in the country totals to about 4.5 crores, of them only 15-20 percent are organised. The rest have remained at the mercy of their employers. Wajedul says that even though the law gives the workers the right to association, in sectors such as ready-made garments, owners intimidate the labourers from joining any collective bargaining association. Nazrul agrees. "The owners sometimes hire goons to dissuade workers from setting up their own trade union," he says, "Labour leaders are sacked sometimes." There are allegations against the trade unions though. Many combined bargaining associations (CBA) at different mills and factories are led by corrupt leaders who trade their ideologies for money. And there is a provision in the labour law that helps them: it says that the president and general secretary of a combined bargaining association cannot be transferred from his posting. Taking advantage of this provision, some leaders indulge in manipulating tenders and other malpractices. Wajedul admits that there are problems but he hastens to add that these labour leaders generally switch their political allegiance after the national elections and the government patronises them as having a pet-CBA in its pocket always helps. Wajedul thinks that the existing provision is going to help the labour movement once the CBAs are freed of these crooked elements. He also points out that agricultural labourers, which make up of a large amount of our labour force, are absent in the labour law. 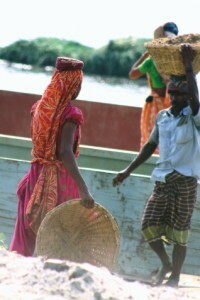 Most of the industrial workers in Bangladesh do not enjoy any holiday, let alone bonus and gratuity. They are never compensated after an accident. Honufa, who lost her son, actually went to the construction site where her son worked to demand compensation. She has been offered Tk 3,000 by the site manager. Even though the government is trying to reform the existing laws, Nazrul Islam Khan remains unimpressed. "I don't think the government officials and the owners are sincere," he says. A bleak prospect for the labourers of the country that aspires to be the next Asian economic powerhouse.